Hot Renault Clio prices revealed | What Car? 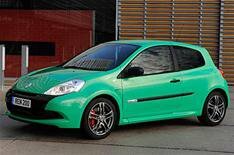 Renault has revealed prices for its hot Clio Renaultsport models. The new Clio Renaultsport 200 Cup and Renaultsport 200 will be priced at 15,570 and 16,570 respectively 75 more than the outgoing model when the cars go on sale on May 15. Expect first deliveries in June. The hot hatches get a new rear diffuser, revised nose and tweaked suspension. Standard equipment includes six airbags, electronic stability control, 17-inch alloy wheels, leather steering wheel and CD/MP3 stereo with steering wheel-mounted controls. The Renaultsport 200 also gets climate control, Renault's keycard, curtain airbags, cruise control and electrically adjustable door mirrors.